Combine rhymes, riddles and poetry with a terse verse! What do you call floral electricity? Flower Power! 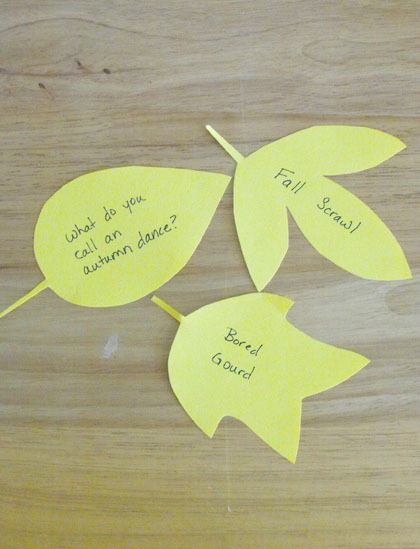 Help your child celebrate the great outdoors by creating a series of terse verse flash cards on leaf-shaped pieces of paper. Help your child cut leaves out of colored paper. While you both work, discuss what you like about nature. Create a list with your child of various nature-themed words. Since terse verse are riddles answered with two rhyming words, start by coming up with some rhymed pairs. Look at your word list. Do any of the words rhyme? If not, pick one of the words and come up with as many rhyming words as possible. Words that rhyme with tree, for example, could be bee, see, free, tee, or knee. Choose a matching pair. Now that you have a rhyming pair, have your child brainstorm questions that will lead people to the correct answer. You might need to help your child out with a couple examples. What do you call a buzzing forest? Bees' trees! Repeat steps 3 and 4 until you have several terse verses. Help him write each terse verse on his paper leaves. The question goes on one side of the leaf, and the answer goes on the other. Use these one-of-a-kind items to decorate the dinner table and see who can get all of them right!